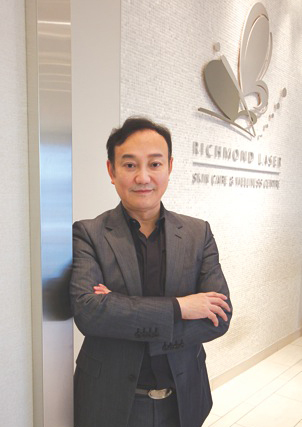 With more than 20 years of experience in cosmetic and laser skincare, Dr. Phoebus Wong is committed to provide his patients up-to-date and truthful facts on the most advanced technology in the skincare field. The goal of fulfilling each and every of his patient’s unique and personal need is achieved by continuous inputting: inputting time in new researches and educational events for the best technologies available on the market, and inputting investment to new and improved equipment from time to time. Either you are frustrated with your current skin condition, or simply looking for new ways to maintain the healthy state of your skin, you should be able to find the solutions that best suit your personal needs at Richmond Laser Skin Care & Wellness Centre. A comfortable environment with advanced facilities that allows you to enjoy the newest technology on skin rejuvenation; a professionally developed medical skin care product line that provide effortless skin improvement in no time; knowledgeable consultants and technicians who give helpful suggestions on various skin conditions; together with Dr. Phoebus Wong’s expertise in laser and cosmetic skin procedures – your goal of having healthy glowing skin is accomplished at the moment you step into Richmond Laser Skin Care & Wellness Centre. Call our clinic today and find out what you can do to impress others, impress yourself.